It was a beautiful Thursday afternoon. Perfect day for the Eagle Battalion Army ROTC at Embry-Riddle Aeronautical University awards ceremony. It’s such an honor to sit among some of our country’s finest young men and women, knowing they are giving their whole selves to our country. And I do love seeing them all dressed in their finest. These cadets work tirelessly to achieve their dreams. Their dedication is surpassed only by their pure desire to achieve success. This year’s recipient of the Crosby Army ROTC Scholarship was Bruce Federico. 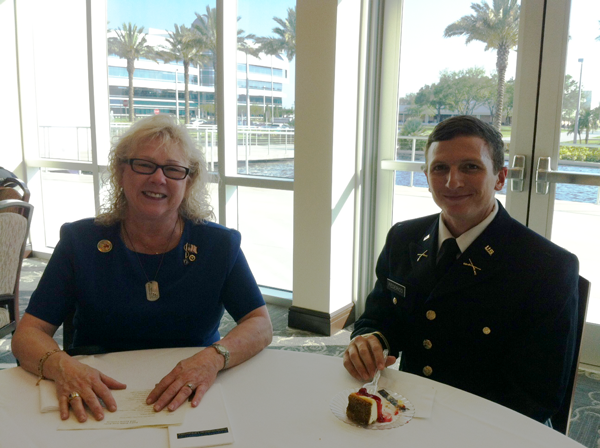 Cadet Federico was accepted to ERAU as a varsity scholarship athlete in August 2010. He dedicated many hours to community support at the YMCA and VFW. Summer 2013, he attended A Cultural Understanding Language Proficiency program as Romania’s Team 1 Executive Officer. At Leadership Development Assessment Course, at Joint Base Lewis-McChord (JBLM), Federico earned RECONDO status as well as an excellent overall assessment from ROTC Cadre. He attend Cadet Troop Leading Training in Fort Wainwright, Alaska, and led an Infantry Stryker Battalion. Back at ERAU he served as Operation Officer, head of the Army Aviation Association of America (AAAA) as Embry-Riddle Chapter President. These efforts helped obtain the American dream, branching Infantry as a Second Lieutenant in the United States Army. This year Tony Recascino was my guest. Tony was instrumental in creating this scholarship. I have worked with Tony for over 20 years. When he heard the news about my brother’s remains being identified and his story, he wanted to do something. He contacted me about setting up a scholarship with the Army ROTC at Embry-Riddle. I had never thought of doing something like this, but when he suggested this, along with wanting to make the first donation, I jumped at the chance. Tony and I contacted the Army ROTC office early 2007, met with the officials and started the process. We joined forces with other donors and shortly after my brother’s remains were buried in Arlington National Cemetery which was late May 2007, we had secured enough funds for the endowment of the scholarship. All the best to you Bruce in your Army career. We are so proud to honor you for all your accomplishments. My brother would be so happy knowing he made a difference in helping you reach your dreams. Thank you.